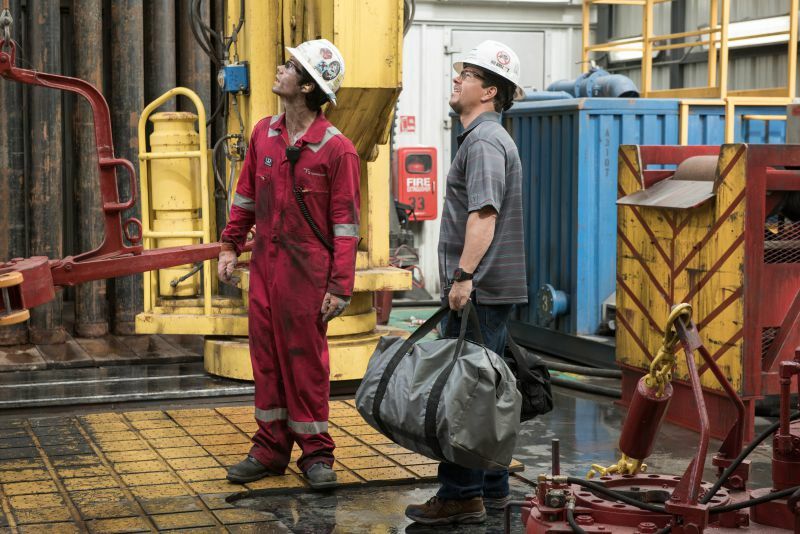 “Deepwater Horizon” may gloss over a number of details and facts, but that doesn’t prevent it from being a surprisingly compelling disaster film. We are introduced to Mike, his wife(Kate Hudson) and 10-year-old daughter first in an almost awkward love scene. As with any self-respecting disaster film, we must be shown how much the lead character is loved and cherished before subjecting him to life-threatening horrors. This slow intro also serves a second purpose. His daughter walks the audience through the mechanics of offshore drilling while practicing a school presentation on what her dad does. She uses a shaken can of Coke, honey,and a brass pipe as her prop, to great effect. Especially when the Coke explodes, showering the kitchen in stickiness. Ominous foreshadowing indeed! Mike meets up with Jimmy and Andrea on a helicopter flight back out to the rig. BP officials have come along as well. Their latest well is 43 days behind and it’s cutting into their profit margin. Suddenly there is a jump-scare bird strike on the chopper!! Ten minutes in and this movie isn’t looking that great. Dull exposition, cheesy family interactions, and a pointless jump-scare which must exist only to wake the audience back up? Thankfully the moment this group steps on board the rig the movie finds its footing. Mike’s interaction with the various crew members is far more believable (and entertaining) than anything we’ve seen yet. Jimmy irately tries to track down who’s behind numerous safety procedures that have been ignored. 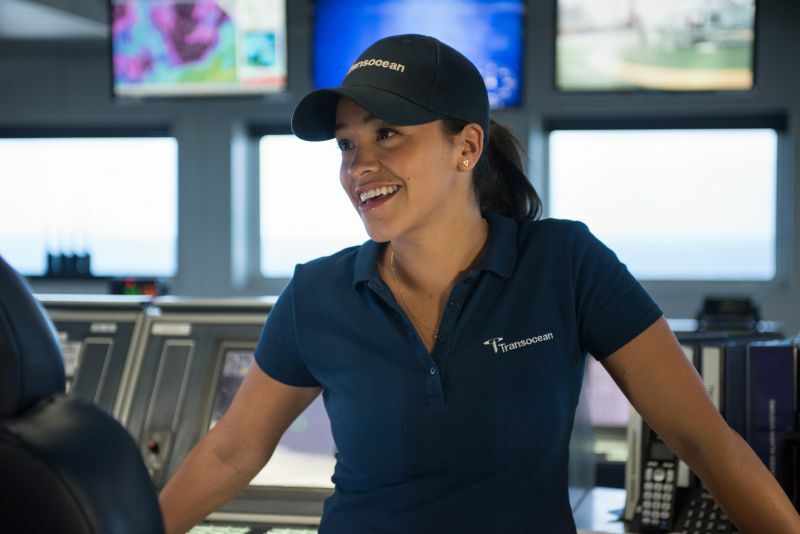 Andrea heads to the bridge and we learn various interesting facts about Deepwater Horizon. Referred to as “semi-submersible” this rig is actually a boat, floating precisely in place with the aid of numerous thrusters. Finally, we are introduced to John Malkovich’s almost cartoonish portrayal of BP Exec Donald Vidrine. The film is delightfully biased in its portrayal of BP as villains and Malkovich certainly has fun taking his character to an extreme. 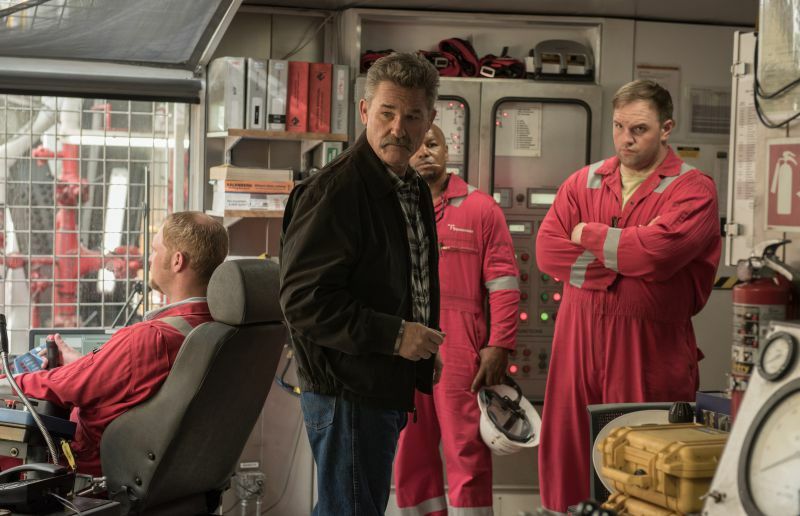 The movie briskly ratchets up tension and it’s not long before a blowback of methane gas from the well triggers a jaw-dropping explosion of epic proportions. So much so that it may leave you questioning if it was exaggerated for dramatic effect. But considering the initial fireball was visible 40 miles away it’s likely more accurate than believable. Coupled with these impressive visual effects is a stunning sound mix that might catch some Academy attention later this year. Not only does it immerse you within the action, you can feel the floor vibrating as the rig quivers from multiple explosions. If possible, this movie should be seen in IMAX or at the very least a theatre with ATMOS sound. Besides the rather lame opening, the only flaws this unapologetic disaster film has is being a bit heavy-handed at times. In addition to the Bond-worth BP villainy, we are subjected to shots of an American Flag slowly waving against a backdrop of burning fossil fuels, and an oil-covered pelican that slams itself around a ship’s bridge until breaking its own neck. Another thought that always lingers with this type of movie is that we are watching the fictionalized death of real people for entertainment. But perhaps it’s still the best way to raise awareness across the largest group possible? A high percentage of those planning to see this film were likely too young to understand or appreciate all the implications of this disaster.